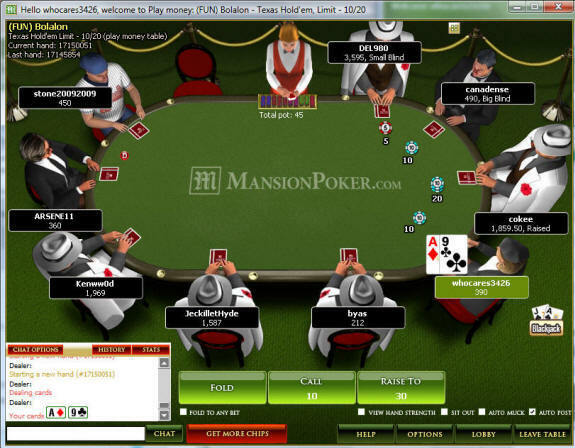 Mansion Poker is one of the largest poker rooms in Europe, and is the flagship poker room on the iPoker network. Mansion offers a $500 sign up bonus, an excellent rewards program, and world class customer support. If you would like a quick look at Mansion Poker, press play to watch the Mansion Poker video review below. Or, you can scroll down and read our full textual review of the site. Ready to play? Visit www.MansionPoker.com and use bonus code SUPERBONUS for your $500 bonus. 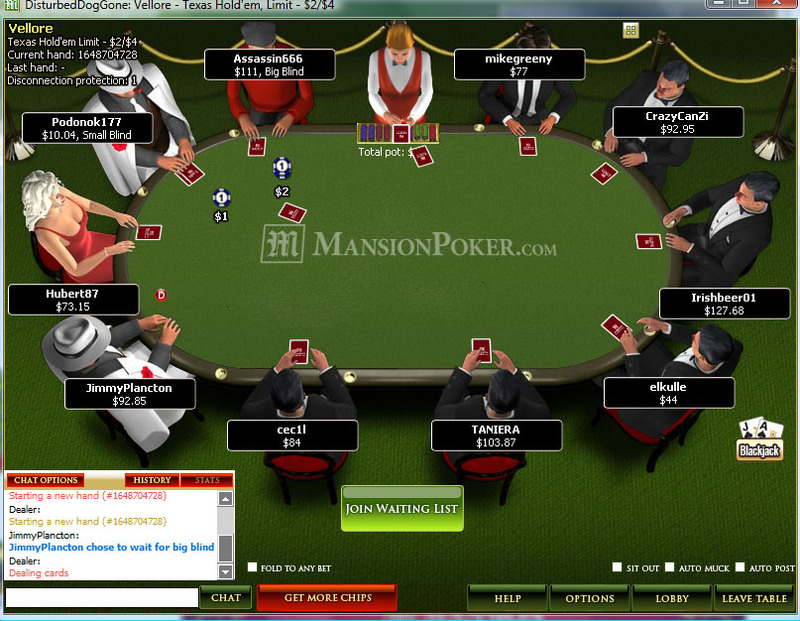 Mansion Poker (www.MansionPoker.com) is one of the premier poker rooms on the iPoker network. The company has been around for over five years, and in that time Mansion has built itself into one of the most recognized online gambling brands in the world. Players love Mansion because of the easy to use software, juicy $500 sign up bonus, and easy to beat competition. Read on to learn more. Mansion players are privy to both the Mansion poker room as well as the Mansion casino, both of which are excellent gambling options. Some other highlights at Mansion include the Club Mansion rewards program, the new player freerolls, and the extensive list of deposit options. Unfortunately, Mansion Poker does not accept USA players. If you are from the United States and would like to play somewhere else, check out this list of USA poker sites. 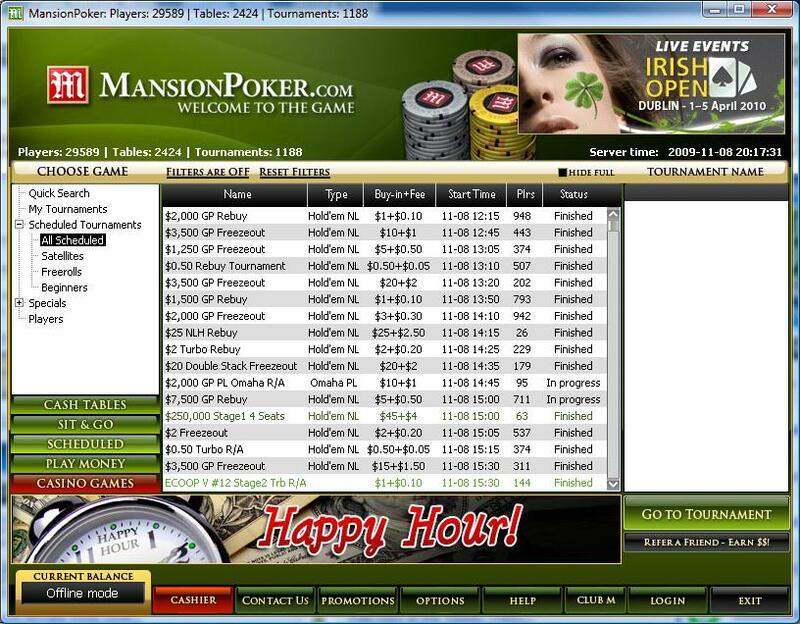 The software at Mansion Poker is provided by the iPoker network, and boasts outstanding graphics and smooth game play. When you log into the lobby you will notice it has a green layout, and is organized in a simple fashion. On the left you can choose between Cash Tables, Sit & Go's, Scheduled Tournaments, Play Money Games, and Casino Games. If you choose one of those five options, the left bar will expand to show you the selection of games in each category. 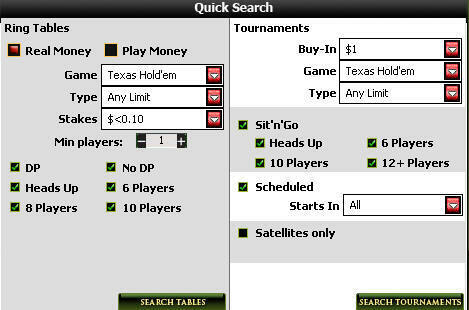 For example, when you click Cash Tables you will see these options: Quick Search, My Tournaments, Limit Hold'em, No Limit Hold'em, Pot Limit Hold'em, Limit Omaha, Pot Limit Omaha, Limit Omaha Hi/Lo, Pot Limit Omaha Hi/Lo, 7 Card Stud, 5 Card Stud, and Beginners' Tables. We love Quick Search because it lets you instantly find games that suit your needs, instead of sorting through hundreds of tables to find one that you like. My Tournaments is another cool feature that tracks the tournaments you are currently registered in or playing. This is useful when you are playing a bunch of tournaments, and are registered in some forthcoming ones as well. If you choose any of the options like No Limit Hold'em or Pot Limit Omaha, the lobby will show you all the tables that offer that game. The software works the same for the other options on the left bar - for example, if you click Sit & Go's you will have the option of seeing All Sit and Go's, Satellites, Heads Up, Beginners, and Private Sit and Go's. The lobby at Mansion is all you can ask for - simple and clean, with fast routes to the games you want to play. Action was on me, and you can see that my player options are displayed at the bottom of the screen (Fold, Call 10, Raise to 20). Some other features at the table include the instant hand history option, which shows you all of the previous hands you have played in the session, including the results of each hand. You can also click on players to make notes on them, block their chat, or add them as your buddy. The software at Mansion is solid, and you won't hear any complaints about the game play or the software's features or usability. Learn more about the software, or learn how to download Mansion Poker. The first promotion at Mansion is their 100% up to $500 sign up bonus. All new depositors are eligible to receive this $500 bonus, and all you need to do to receive the bonus is sign up at MansionPoker.com with bonus code SUPERBONUS. By following our links, or using our bonus code (SUPERBONUS), you are guaranteed to receive the exclusive $500 bonus. Once you have deposited, your bonus money will be held in a separate bonus account. Money in your bonus account cannot be wagered or withdrawn - you have to clear the bonus before you can wager or withdraw the bonus money. To clear the bonus you have to earn Mansion Club Points (MCPs). Players earn MCPs by playing real money ring games, sit and go's, and tournaments. For sit and go's and tournaments, you earn twenty (20) MCPs for each dollar paid in tournament fees. So, if you enter a $30+$3 tournament, you earn 60 MCPs. Every time you earn 1000 MCPs, you will clear $10 from your bonus account into your cashier, where you can then wager and withdraw it as you please. The bonus expires 60 days after your first deposit - any bonus money remaining at that point will expire. Mansion Poker also offers a refer a friend program, which allows you to refer your friends to Mansion Poker and receive cash bonuses if they sign up. To actually refer your friends, log into the Mansion Poker lobby and click "Invite a Friend". Then, input your friends emails. Your friends will automatically receive an invitation email from Mansion Poker, and as long as they sign up within two weeks of receiving the email, you will both be eligible for your bonuses. You must be a current Mansion Poker real money player to refer your friends. Your friends must have never played at Mansion Poker before. You will receive your $75 once your friend has signed up, deposited at least $50, and earned 200 MCPs. Your friend will also receive a $25 bonus. Note that both the $75 bonus for the referrer and the $25 bonus for the referred friend have to be cleared before you can wager or withdraw the money. To clear the bonus, you have to earn 1000 MCPs per $10 of bonus. Mansion Poker offers an easy way to quickly rack up MCPs and clear your bonus. Every Saturday and Sunday from 16:00 to 18:00 GMT, poker tables at Mansion Poker will award all players with double MCPs. This makes it much easier to clear your bonus and earn Mansion rewards. No Limit Hold'em is the most popular game at Mansion, and is offered in stakes ranging from $0.01/$0.02 to $200/$400. At the time of this writing, the highest game running is a $100/$200 game. Mansion offers traditional ten handed games, as well as six handed games, eight handed games, and heads up games (two handed). They also offer some tables that limit buy-ins to fifty big blinds, which loosens the table. Traffic at the other games is slower, but you can still find a table as long as you aren't looking for super high stakes games. For example, the highest Seven Card Stud game running right now is a $3/$6 game. One nice feature about Mansion Poker is their Beginner Tables. These tables are exclusively available for new players at the site, so if you have just signed up you can play against the new players before trying your luck against the seasoned veterans. Mansion has quite a few nice tournaments that players can test their skills in and aim for a huge payout. For new players, there are three freerolls a day that let you build your bankroll as you learn the game (you have to have signed up within the last 90 days to compete in these freerolls). For seasoned players, there are countless daily guaranteed tournaments throughout the week. A few of the more popular guaranteed tournaments include the $5,000 Guaranteed $3 re-buy tournament at 4:15 GMT, the $10,000 Guaranteed $25 tournament at 12:05 GMT, and the $20,000 Guaranteed $30 re-buy at 16:15 GMT. These are just a few of the guaranteed tournaments that run every single day. Sunday is when the really big tournaments run, including their monstrous $215 buy-in, $250,000 guaranteed tournament. You don't want to miss this one. To play in all of Mansion's tournaments, including their daily freerolls for all new players, visit MansionPoker.com and create an account. Club Mansion is Mansion's rewards program that provides bonuses and comps to players who are loyal to the Mansion brand. Club Mansion is a tiered system that provides better rewards for players who climb to the top of the ladder. There are eight total levels, ranging from Player to Diamond Club (Three Diamond). 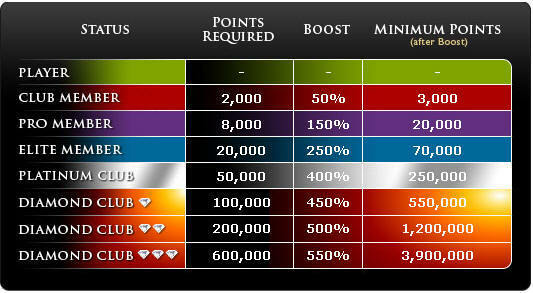 As you can see, once you reach higher levels you receive "Boosts" which allow you to accumulate points even faster. To earn these points, you simply have to play real money ring games, sit and go's, or tournaments. Every dollar you spend on tournament fees is worth twenty points, and you can earn between 0.2 points and 13 points per hand at ring game tables depending on how much rake is taken. Club Mansion members can earn a variety of rewards, including daily freerolls, loyalty shop gifts, level specific gifts, and even cold hard cash for earning certain amounts of points. The Mansion support team is available twenty-four hours a day, seven days a week. You can contact a Mansion support rep by email, phone (+350-200-4100), fax (+350-200-41001), or by mail. Mansion Poker support reps know their stuff, and were professional and courteous when we spoke with them. Check out all of the deposit and withdrawal methods that MansionPoker.com accepts. Visa, MasterCard, NETeller, InstaDebit, PaySafeCard, Bank Transfer, EcoCard, myCitadel, EntroPay, Moneybookers, ClickandBuy, Click2Pay, Ukash, iDeal, POLI, WebMoney, UseMyBank. Thank you for reading our review of the MansionPoker.com poker room. If you like what you read, you can get started by heading over to www.MansionPoker.com. Remember that Mansion Poker has been in business for over five years, and offers the professional level of service one would expect from an established online poker room. Although Mansion does not accept USA players, all other nationalities are welcome at the Mansion Poker room. Also, if you decide to sign up and deposit soon, you will receive the 100% up to $500 Mansion poker bonus. Remember to play during "Happy Hours" to rack up MCPs quickly, and clear your bonus as fast as possible. To redeem the bonus, use bonus code SUPERBONUS. Good luck!